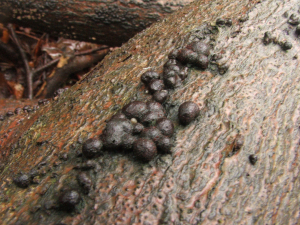 Observation - Beech Woodwart (Hypoxylon fragiforme) - UK and Ireland. Description: small spherical knobbly growths, woody and hard to the touch, growing on surface of bark, on felled wood that lay on woodland floor. small spherical knobbly growths, woody and hard to the touch, growing on surface of bark, on felled wood that lay on woodland floor.